Once upon a time, a long time ago, I was taken on a day trip up to London with my parents and brother. The highlight was a visit to London Zoo where we got to see the giant panda, Chi Chi. I was so excited! By this stage, however, she was very old and no doubt rather cranky with all the hordes of tourists peering at her, so you could only just get a glimpse of her fast asleep in her pen! I didn’t realise how long ago this actually was until I started doing some research for this post and discovered that Chi Chi passed away on 22nd July 1972! Ever since then I have been fascinated by pandas, especially as they are such an endangered species. The World Wildlife Fund set up in 1961 is famous for its giant panda logo. Sir Peter Scott, who was one of the founders of the WWF, said the panda logo was chosen as the panda is, “an animal that is beautiful, endangered and one that is loved by many people”. Our daughter, Mlle Chic Fille, had visited Berlin Tiergarten (Berlin Zoo) in 2011 and sent me a photo of the giant panda she saw there. Therefore on our trip to Berlin last year, we set off to the zoo (yours truly like an excited schoolgirl) so I could finally see a “real” panda again after so many years! Round and round the zoo we walked but all we could find at the panda enclosure marked on the map were some exotic geese. Eventually in the monkey enclosure we came across a panda but it was not the one I was hoping to see! By this stage Monsieur Le Chic’s patience was beginning to wear a bit thin as there were many other places in Berlin we were still hoping to visit, so I agreed to go to the information booth and asked in my best German, “Was passiert mit dem Panda?” which translates as, “What’s happened to the panda?”. The lady at least understood what I’d said as she answered, “Leider, letztes Jahr ist der Panda gestorben!”. Oh no – “unfortunately the panda died last year!”. Bao Bao was very old by panda standards and had passed away at the ripe old panda age of 34 years old the previous August. We had arrived a few months late to see him – very upsetting! I must add that Berlin Tiergarten is a fine zoo but after my disappointment I was in no mood for a lingering look around, so we headed off to do other things! 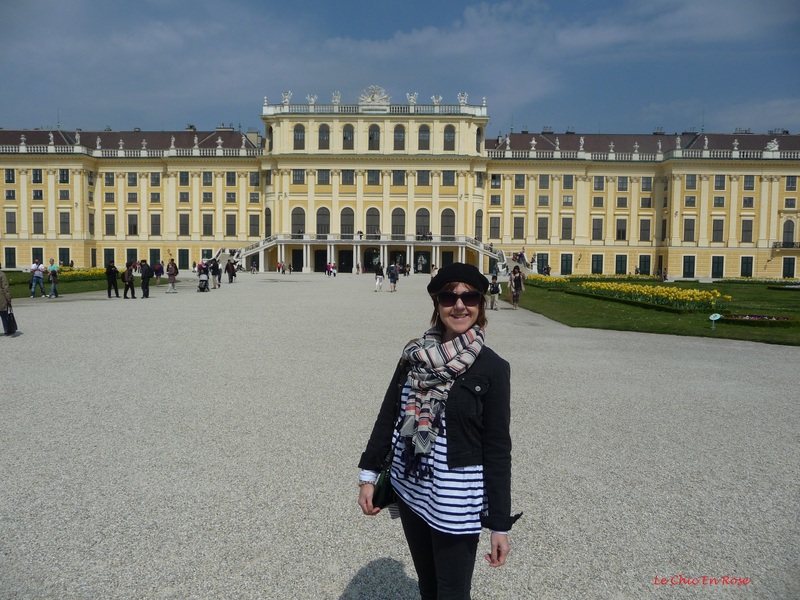 Fast forward a year and we found ourselves in Vienna this April with just 4 days to look around and the zoo was not high on Monsieur Le Chic’s priorities. However we were keen to have a tour round Schoenbrunn Palace, which we duly did before I spotted a sign to the Tiergarten. What I hadn’t realised is that Vienna Zoo (or Schoenbrunn Tiergarten) is in fact in the grounds of the palace – not a bad setting really! I had also read that Vienna Zoo had giant pandas but scarred by our experience in Berlin, I was not confident we would actually be able to see any! Since I was in a race to find the pandas I didn’t take too many photos along the way though we did see a magnificent peacock and some fine looking lions as we sped towards the area marked as the panda enclosure! Although we did appear to be in the right place, I couldn’t initially see any signs of pandas apart from the information board so was starting to get a bit concerned when suddenly out from the bushes “strolled” a very active and distinctive looking panda! We spent quite a while just watching him (or her I wasn’t sure which was which!) wandering around the grounds of the enclosure and then later tucking into a feast of bamboo shoots with his/her mate! One of the 3 giant pandas who currently live in Schoenbrunn Tiergarten. There are 2 parents and their baby son. Finally seeing a “real” panda again! It was fascinating to watch the pandas eating their meal! There must be something in the waters at Schoenbrunn Zoo as not only do they have a high success rate for many of their breeding programmes, they have had amazing success with the giant pandas. The pair we saw, Yang Yang (female) and Long Hui (male) have had no less than 3 panda babies all conceived naturally, which is unusual in captivity. The most recent addition is Fu Bao (the happy leopard) and he came into the world on 14th August 2013. He has 2 older brothers, Fu Long (the happy dragon) born on 23rd August 2007 and Fu Hu (the happy tiger) born on 23rd August 2010 (August must be panda baby time!) who have both now been repatriated to China as part of the conditions of “loaning” pandas to zoos outside of China. Young Fu Bao will be able to stay at Schoenbrunn until he is 2 years old and then he will rejoin his brothers in China. Schoenbrunn is the oldest zoo in the world and was established in 1752 on the orders of the then Holy Roman Emperor, Francis 1, husband of the Hapsburg Empress Maria Theresa. It was to be used as an imperial menagerie (must have been fun for all their many children!). It was centred around a pavilion meant for imperial breakfasts and the animal enclosures fan off from this point. The pavilion was also a favourite spot of Emperor Franz Josef who spent his last years at Schoenbrunn Palace and who died here on 21st November 1916. Today the Cafe Restaurant Kaiserpavillon is situated at the centre of the zoo and makes a rather impressive location for a cafe/restaurant! The paths fan off in all directions from the pavilion! Inside the Kaiser Pavilion! The building is very impressive. Perhaps you recognise the ceiling detail from Le Chic En Rose cover photo? The paintings on the ceiling of the pavilion are wonderful! 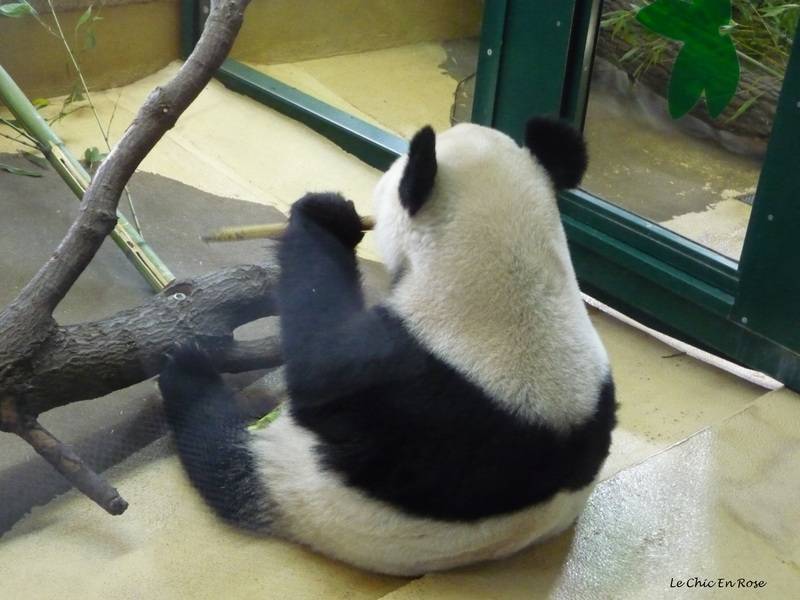 The panda enclosure is conveniently situated just down a path from the Kaiser Pavilion so after our pleasant lunch in the spring sunshine, we popped back to see them once more – still tucking away with gusto into their bamboo shoots! The pandas were enthusiastically eating their lunch! 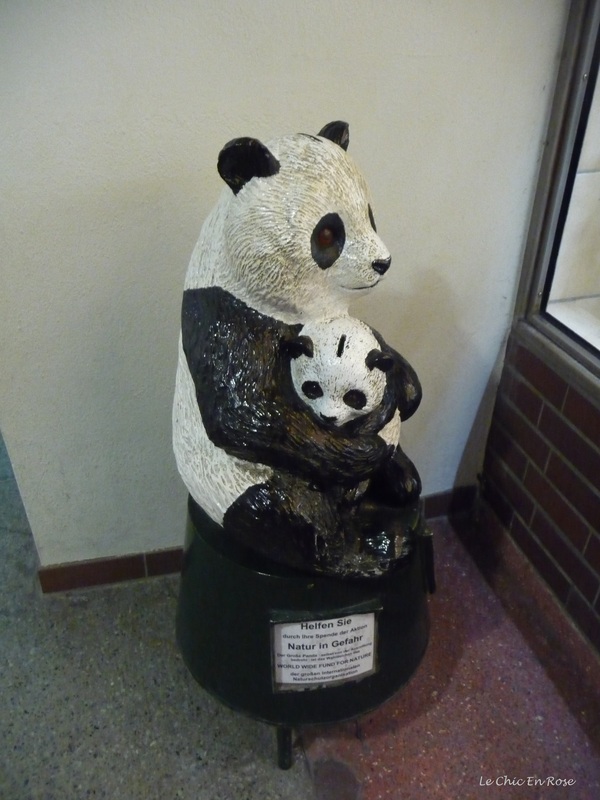 Nice post – I remember going to see the Panda at London Zoo. Thanks Andrew am glad it wasn’t just me who saw Chi Chi I realised I was showing my age! I can remember it so clearly too! I’ve got a bit of a strange fascination with pandas too Rosemary! We saw these very same ones (at least I think they were!) at Schoenbrunn about 5 years ago – much excitement from me. I could watch them eating for hours even though nothing much happens. We have been wanting to visit the pandas at Edinburgh zoo, get really excited every year when they announce the female might be having a baby then disappointment when a few months later it’s a false alarm! Wonder what the Austrian secret is!! Great post Rosemary! I have never seen pandas! Hope that I will one day though! I am happy you got to see them. They are so cute, and the pictures you took are amazing! I know ! But even if I had known, I’m not sure I would have had time to see them. No I realise that Gin you were on a work trip might have been difficult to justify a trip to the zoo!